Copyright (c) 2015 by Kathleen J. Honda & Makoto Honda. All Rights Reserved. This book is available in three editions: Color paperback, BW paperback, and Kindle edition. 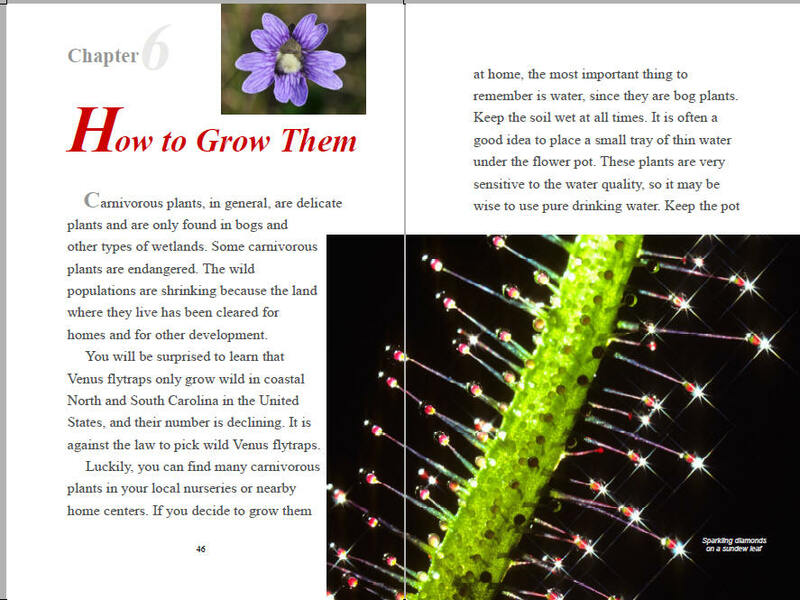 This is a natural science book for a young audience, ages 7-9 (grades 2-4), on the subject of carnivorous plants. 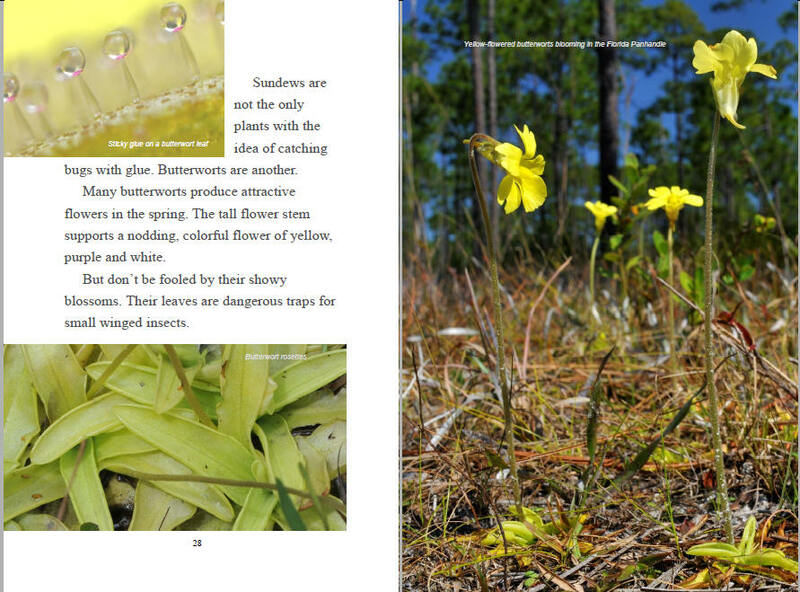 These are unique plants found in bogs and swamps. The soils where they grow are very poor in nutrition. In order to survive in these hostile environments, some plants have acquired an ability to catch and digest insects and other small bugs. There are over 750 kinds of flowering plants that possess this meat-eating habit. 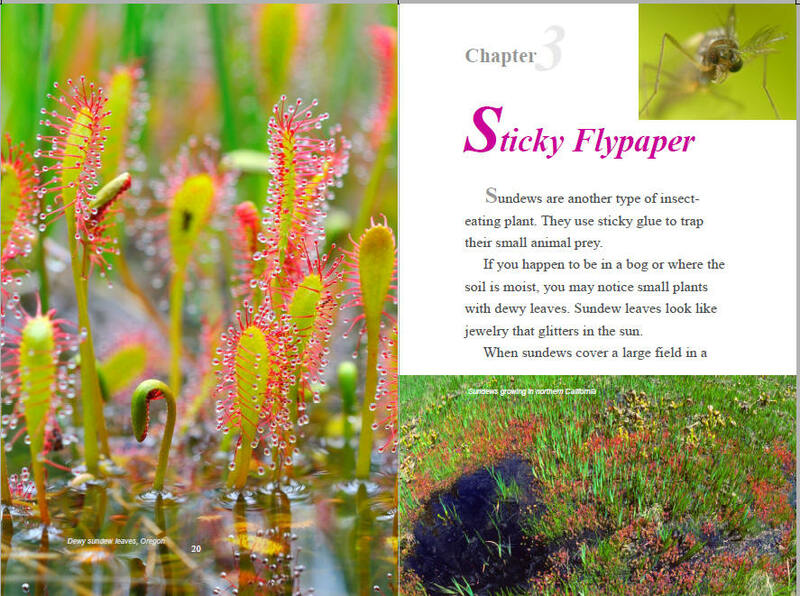 These plants are collectively known as carnivorous plants because of their unique lifestyle. 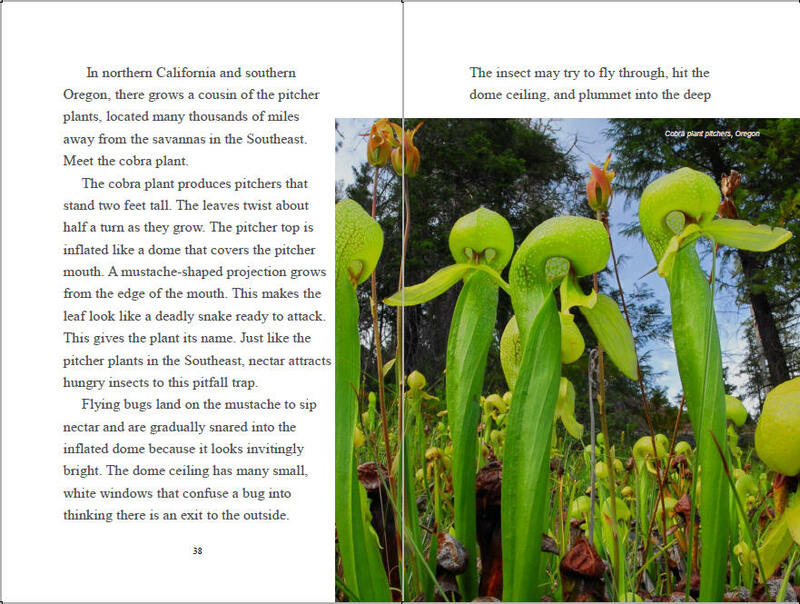 Carnivorous plants are found worldwide. Some grow widely while some are restricted to a small area. 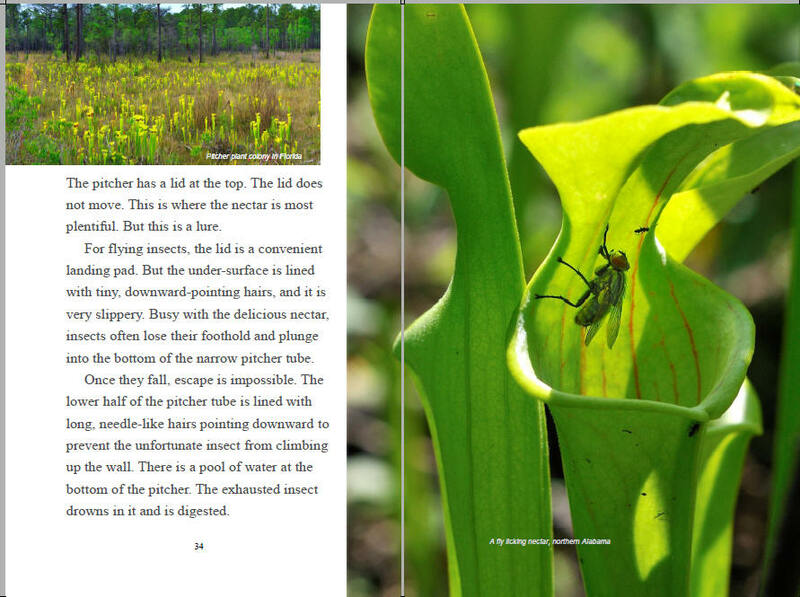 For instance, the Venus flytraps grow wild only in coastal North and South Carolina in the United States. 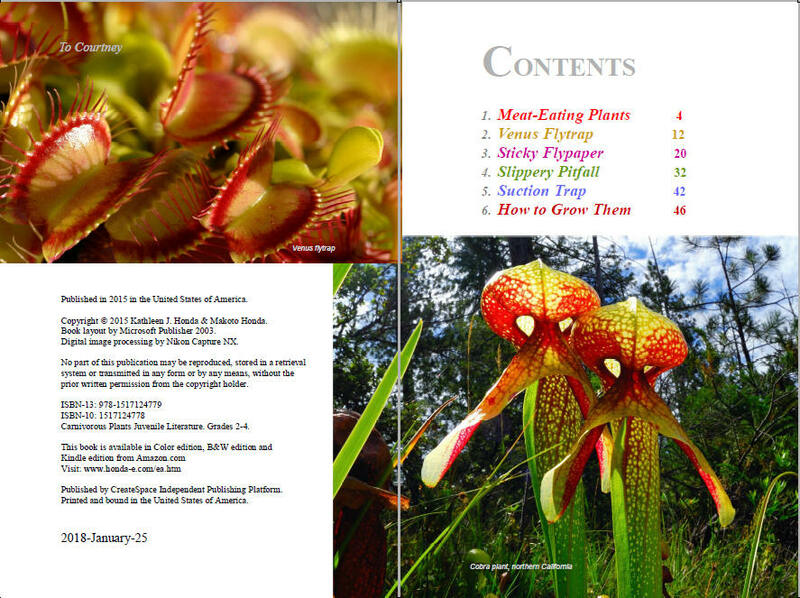 There are four major trap types used by carnivorous plants: Snap-trap (Venus flytrap), pitfalls (pitcher plants/cobra plant), flypaper traps (sundews/butterworts), and suction traps (bladderworts). 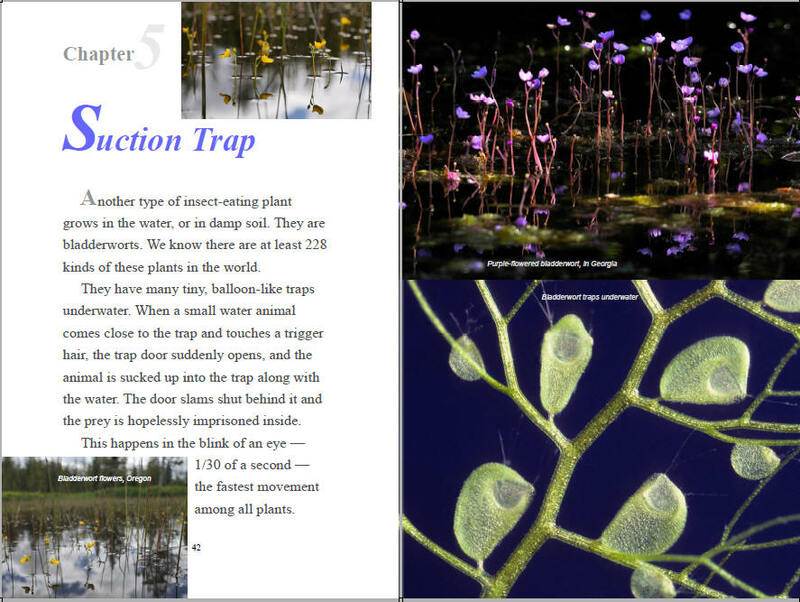 You will learn each of these trapping mechanisms as you read along. 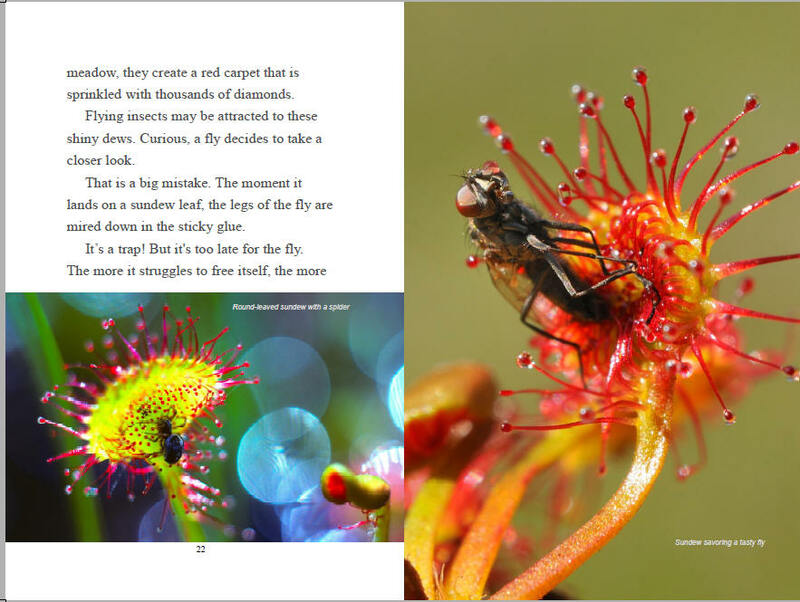 Just like normal plants need to attract pollinators to their flowers, carnivorous plants need to attract prey to their deadly traps. 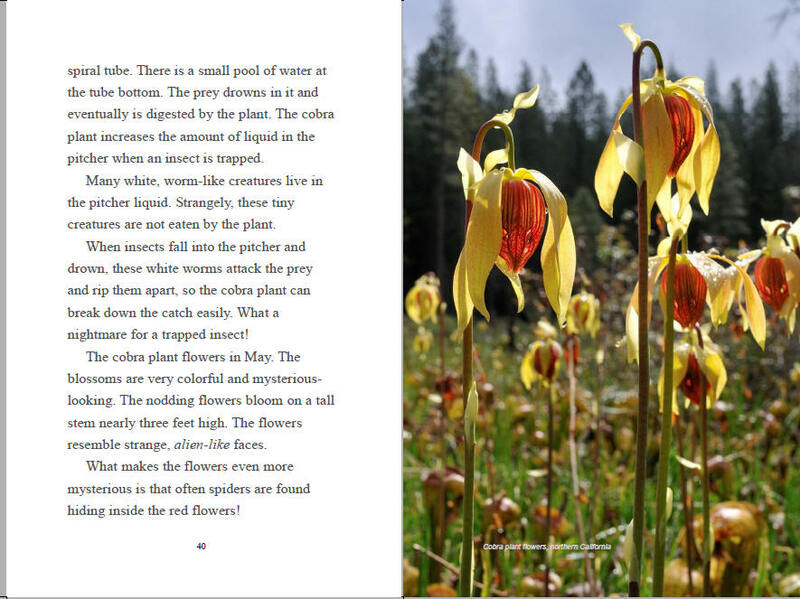 In order to achieve this, many carnivorous plants disguise their traps with brilliant colors and sweet nectars, just like real flowers do. Often, this trick is so effective that insects visit the trap in the same manner they visit flowers - and are captured and eaten! 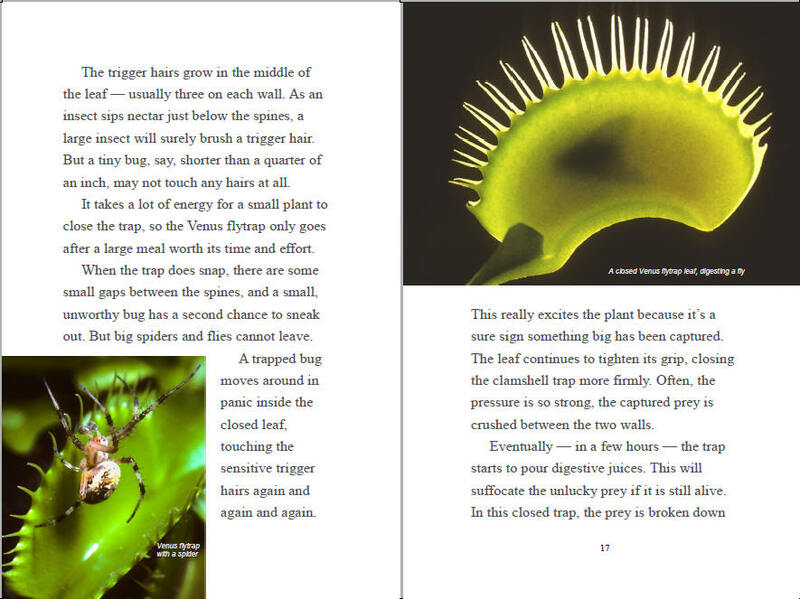 Did you know that you must touch Venus flytrap's trigger hairs, not once, but twice to close the trap? 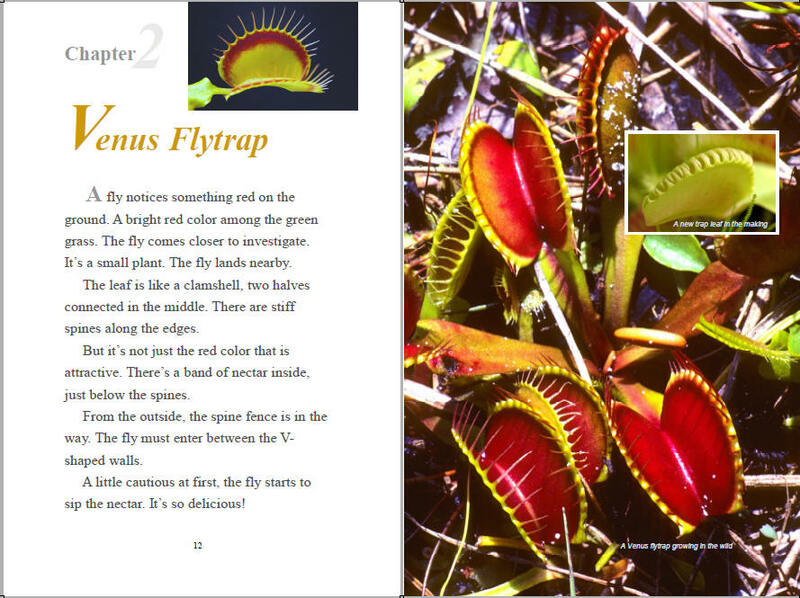 Venus flytraps catch and eat only large, worthy bugs, and tiny bugs are let go. 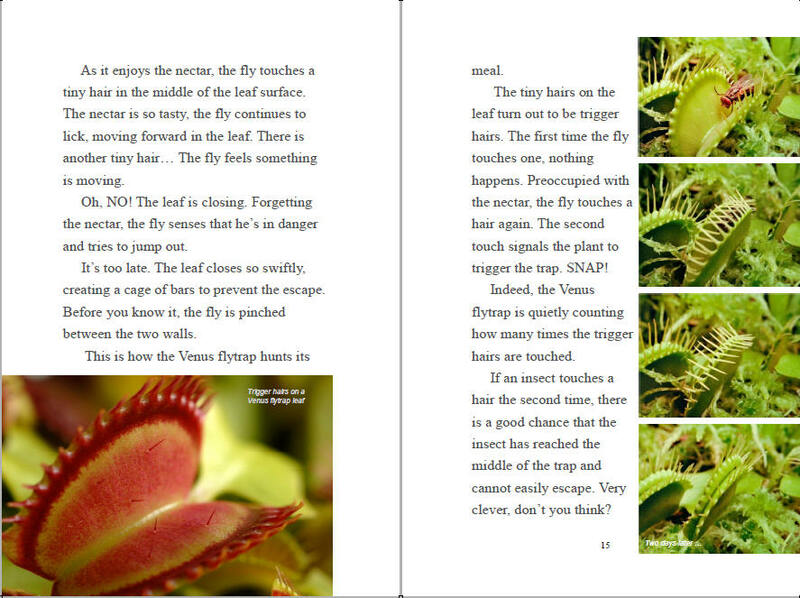 How many times do you think you can trick a Venus flytrap's trap with your finger before it stops responding? All these and more are described in detail in the book. 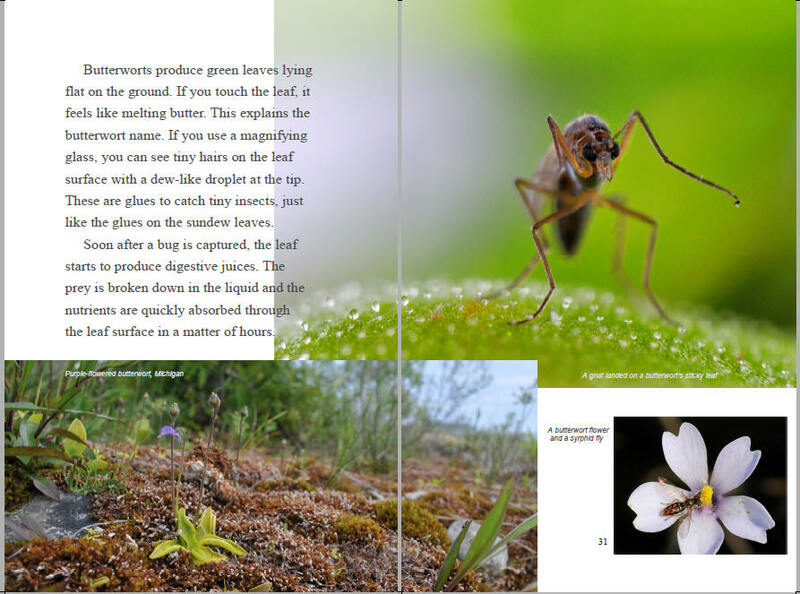 This is an informative natural science book filled with many vivid images accompanying the text. 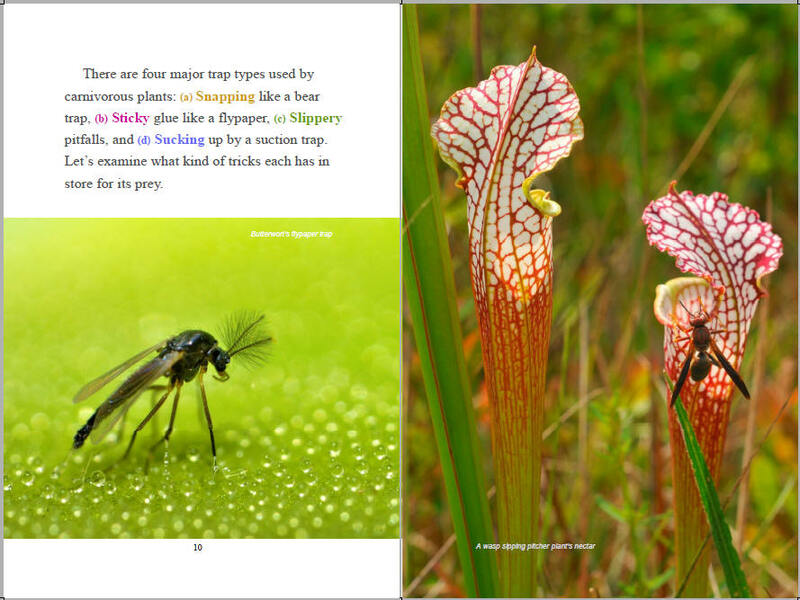 This book takes you and your young audience to the natural habitats of North America where many carnivorous plants grow wild. This is a good reference book for a school science project. Enjoy! It is an excellent book that is packed with information and can be kept in libraries for reference and science projects. It is interesting not only for kids, but also for adults. 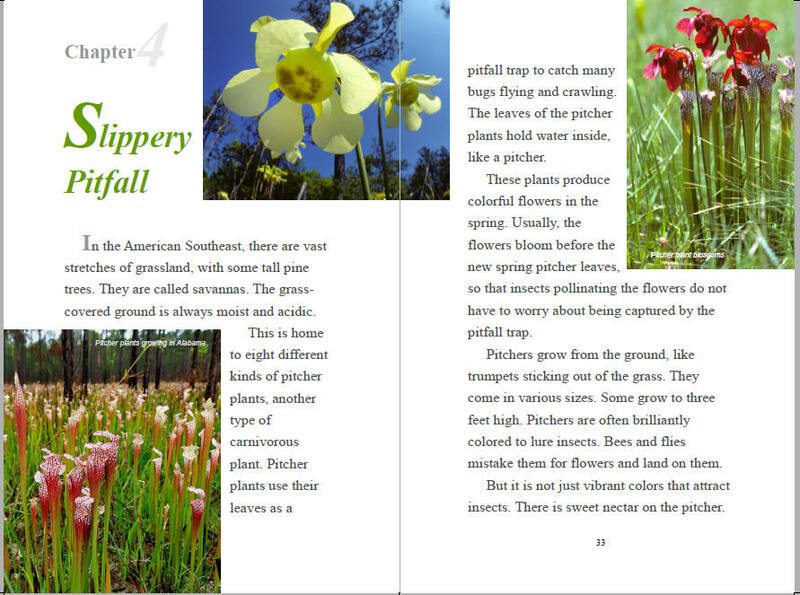 The pictures complement the book, making it colorful and appealing to kids. 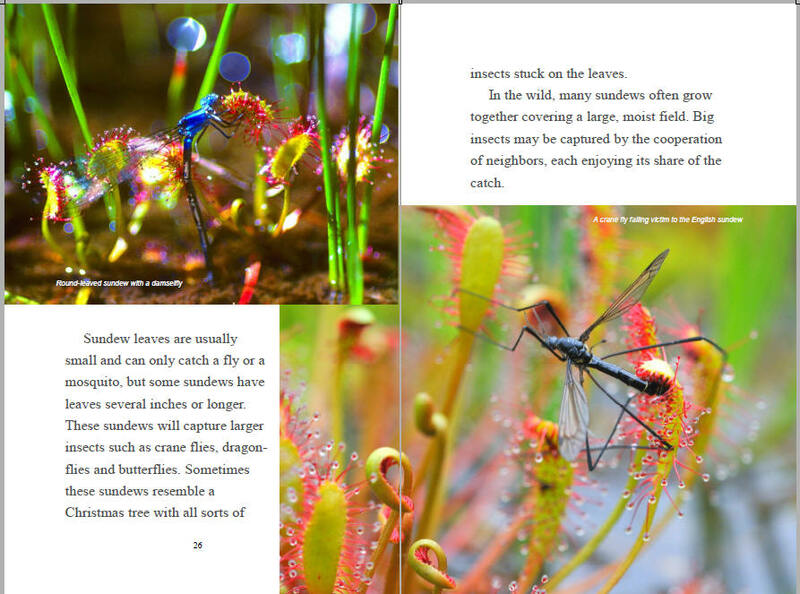 I enjoyed reading about the four different types of carnivorous plants. 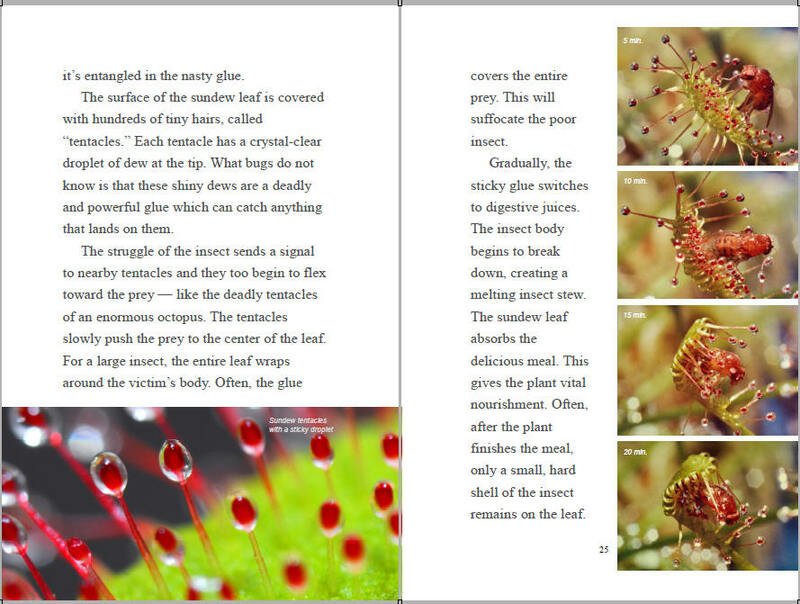 The descriptions are detailed and the pictures are indicative of how an insect views the plant. The writing style is easy for kids to understand. 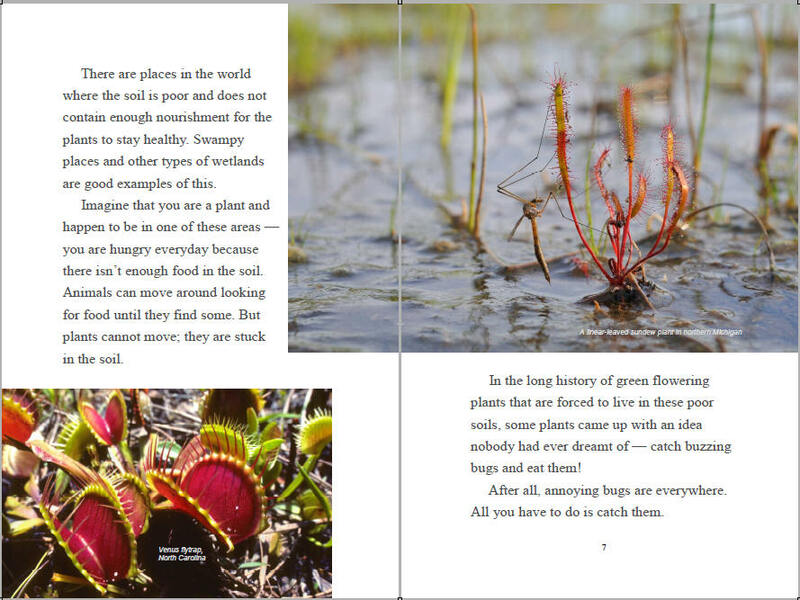 The book told me a lot about carnivorous plants. It is quite interesting to learn that these plants can be grown at home. 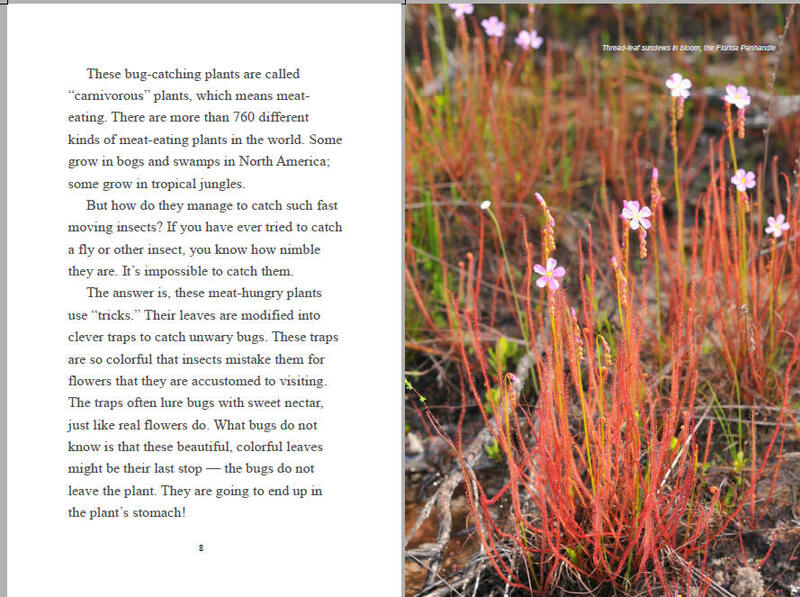 And it is also amazing to learn how these plants with beautiful and delicate flowers actually trap creatures and eat them. I thoroughly enjoyed reading this. Very useful and informative. 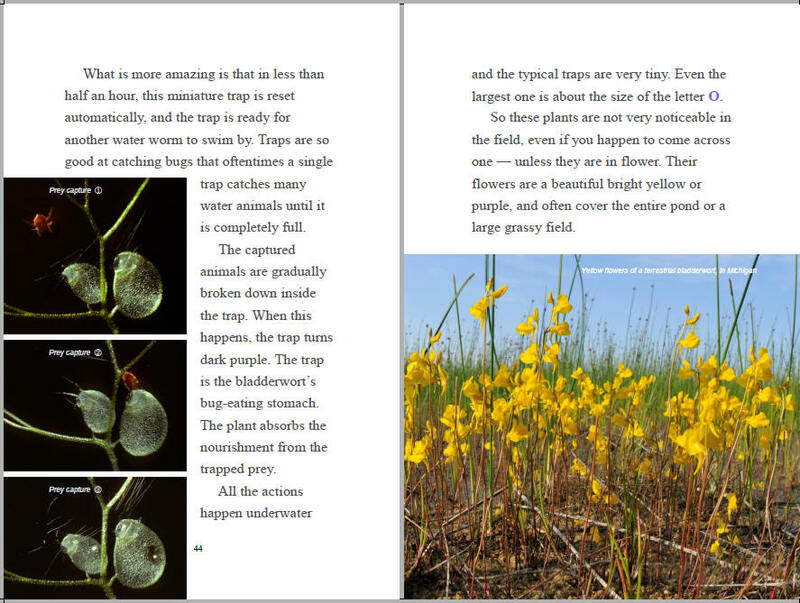 We wrote this book to introduce a young audience to the wonder of the natural world. 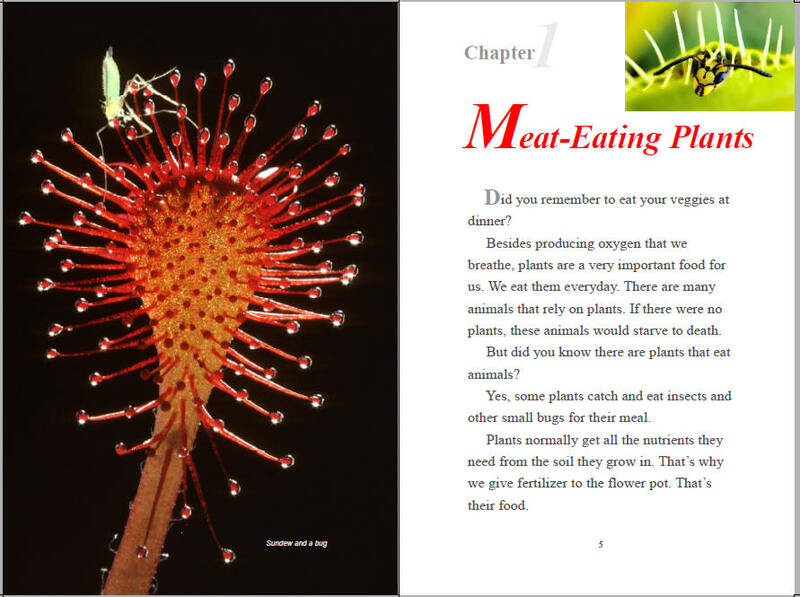 Everybody assumes that plants are to be eaten by animals. We only think of man-eating trees in the movies and cartoons. 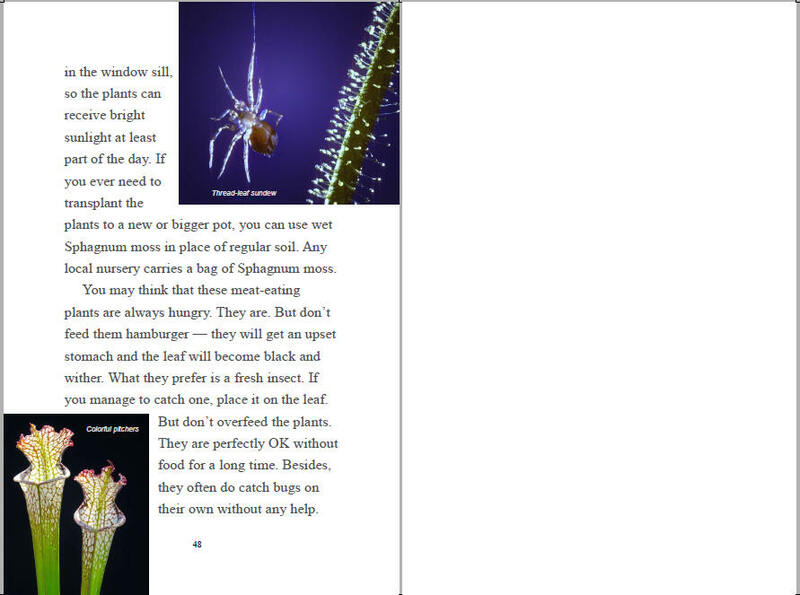 But there are, indeed, plants in this world that catch and eat small animals for nourishment. 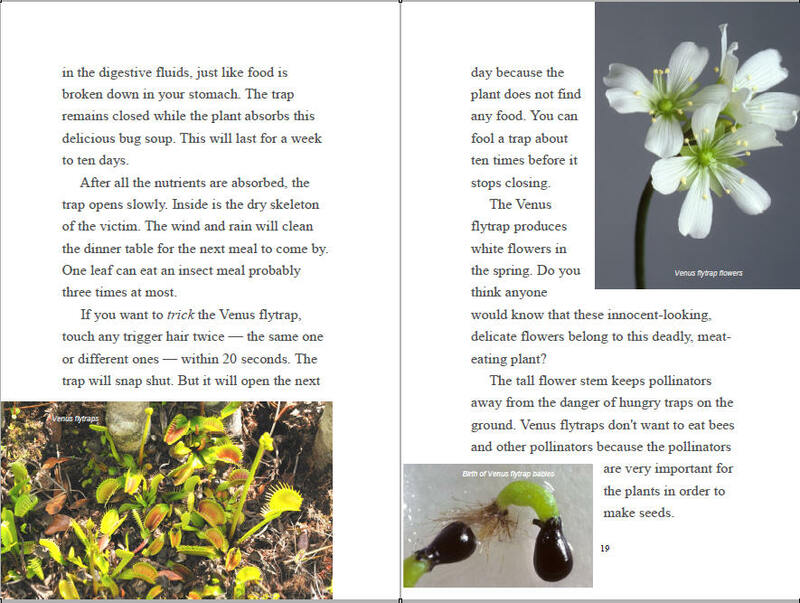 These meat-hungry plants are called "carnivorous plants." 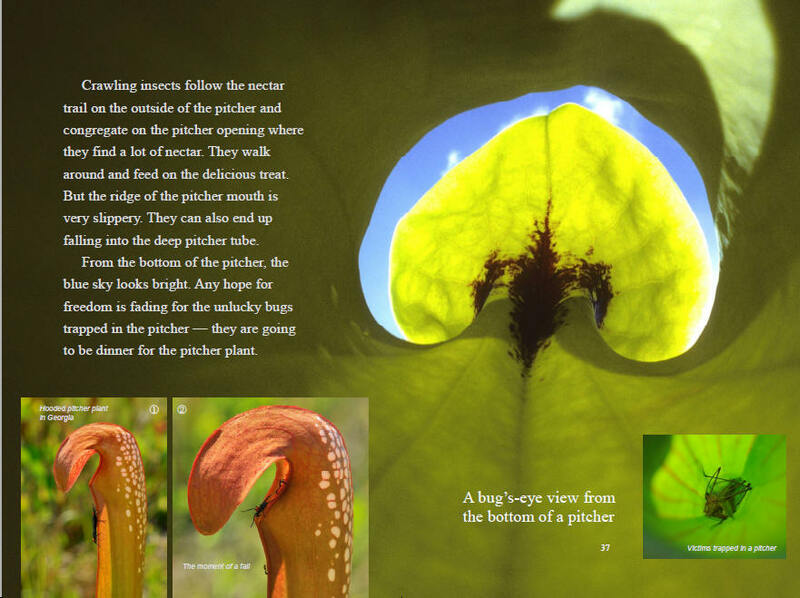 One of the greatest naturalists of our times, Charles Darwin, published a book "Insectivorous Plants" in 1875. The title means "insect-eating." 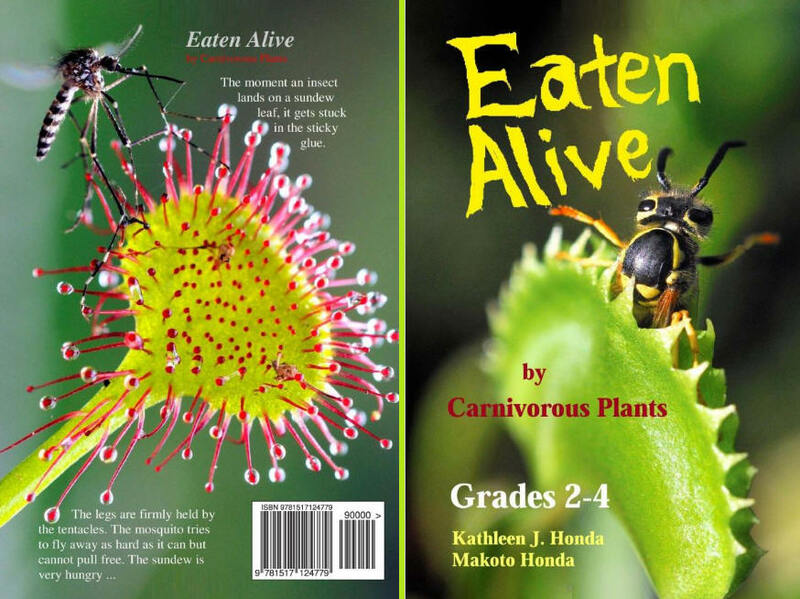 In the history of botany, Darwin was one of the first to demonstrate --- with convincing evidence --- that some plants had been adapted to the carnivorous habit. 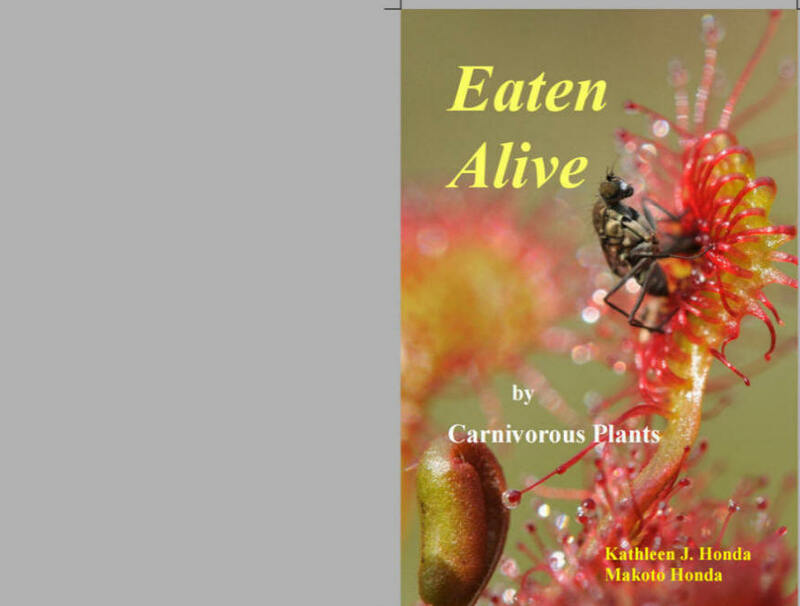 Since the diet of these plants are not restricted to "insects", but also includes spiders and other small creatures, the term "carnivorous plants" is more general and appropriate. Copyright (c) 2014 by Kathleen J. Honda & Makoto Honda. All Rights Reserved.